Provide comfort for the family of Muriel Ballantyne with a meaningful gesture of sympathy. Passed away peacefully at the Brockville General Hospital, Garden Street Site on Saturday, March 23, 2019. 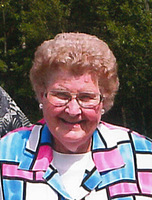 Muriel Marjorie (Hanna) Ballantyne, at the age of 98 years. Beloved wife of the late David Ballantyne and dear mother of Bruce Ballantyne. Fondly remembered by her daughter-in-law Carol (Boyd) Ballantyne. Loving grandmother to Kevin Ballantyne and Jason (Camille) Ballantyne and great grandmother of Ava. Also survived by her sister-in-law Betty Nantel and by several nieces and nephews. She was predeceased by her parents Sherwood Hanna and Phoebe Hanna; her sisters Bessie Earl and Audrey Slack and by her brother Elmer Hanna. Special thanks to the health care team and volunteers at the palliative care unit for the exceptional care and support. A private family service will take place at the Irvine Memorial Chapel, 2451 County Road 15, Maitland. As expressions of sympathy, donations to the Brockville and District Hospital Foundation Palliative Care will be gratefully acknowledged. Send condolences or make a donation online at www.irvinememorial.com. A private family service will take place at the Irvine Memorial Chapel, 2451 County Road 15, Maitland. As expressions of sympathy, donations to the Brockville and District Hospital Foundation Palliative Care will be gratefully acknowledged. We encourage you to share your most beloved memories of Muriel here, so that the family and other loved ones can always see it. You can upload cherished photographs, or share your favorite stories, and can even comment on those shared by others. Provide comfort for the family of Muriel Marjorie Ballantyne (Hanna) by sending flowers. Please accept my condolences on the passing of Muriel Ballantyne, she was such a wonderful lady & I enjoyed visiting with her every time I was volunteering at the hospital, Muriel had such a sense of humor, & she was such a happy lady. Her son was so faithful who visited his Mom everyday & also a grandson who Muriel loved.. Muriel was always so thoughtful & so caring of everybody who visited her. A very special lady. God Bless You. Sincerely MaryLou Price. May the family of Muriel Marjorie Ballantyne please accept my sincere condolences hoping you find comfort in God's words at Acts 24 : 15 and Psalm 37 : 29.